Vodafone Voodoo: PC “Homes” in on Finance. This is a sincere effort to know. P Chidambaram (PC) must be both relieved & excited. Relieved because he moved out of Home Ministry, when days earlier Tarun Gogoi, Chief Minister of Assam, had belligerently said <<I kept telling Centre we need more Central forces… Didn’t get any intelligence input from Centre.>> and PC had to admit that <<There was not enough police force on ground initially when first violence erupted on July 19 but subsequently the security forces came>>. Unlike Sushil Kumar Shinde, who was elevated as home minister soon after 2 major power grid collapses on consecutive days under his supervision as Power Minister, and who had drawn widespread flak & derision for it; PC by contrast, who is known for his “efficiency” and “ability to deliver”, received hardly any adverse scrutiny for his failures in the Home ministry. He was called out of his favourite Finance Ministry in 2008, where his “creative talents” found full expression – such as his 1997 controversial VDIS, which granted <<income-tax defaulters indefinite immunity from prosecution under the Foreign Exchange Regulation Act, 1973, the Income Tax Act, 1961, the Wealth Tax Act, 1957, and the Companies Act, 1956 in exchange for self-valuation and disclosure of income and assets>> and which was condemned by CAG as abusive scheme and fraud on the genuine taxpayers in intent and in implementation – to home ministry soon after the Mumbai Terror attacks. He replaced Shivraj Patil, who was known more for his sartorial tastes than much else, and was expected to inject “dynamism” & “purposefulness” in the rudderless security establishment of the country. PC launched with great vigour *Operation Greenhunt* to combat the Maoist insurgency, which is described as the gravest threat to Indian State by none less than PM Manmohan Singh. He also piloted the formation of National Investigation Agency (NIA) & National Counter Terrorism Center (NCTC) to combat terror attacks; though his vision of NCTC failed to enthuse several state governments, who refused to come on board. Under his *vigilant guard*, several significant terror attacks shook India: Varanasi (September 2010), Mumbai (July 2011), Pune (February 2010), & New Delhi (September 2011 & February 2012). His leadership at Home Ministry also oversaw some of the biggest casualties suffered by the security personnel: 76 CRPF & Police personnel killed in Chhattisgarh(April 2010), 24 jawans killed of Eastern Frontier Rifles in Bengal(February 2010), 26 policemen killed in Chhattisgarh (June 2010), & 15 policemen killed in Maharashtra(March 2012). He has left Home Ministry without having any decisive impact on either Maoist insurgency or terrorism. Yet, he is still perceived as “capable” by media may be because of his suave urbanity and articulation. Both shinde and Chidambaram got to change their chairs this time around because Pranab Mukherjee, who as finance minister proved to be a “disaster” for Indian Economy according to industry, media & “pundits”. While Mukherjee & Shinde are castigated before “promotion”, Chidambaram is not. Why? Riding on the “high expectations” of an economic turnaround under his stewardship, PC has moved in his 3rd avatar as finance minister with lightening hurry. R S Gujral, the finance secretary, was divested of crucial revenue portfolio as he was seen as the architect of *crucial clarifications* made to the provisions of Income Tax act in the finance bill-2012 that was piloted by Mukherjee. These clarifications sought to undo the Supreme Court judgment that absolved Vodafone of paying capital gains tax of some INR 13,000 crores, which Vodafone was expected to deduct from the amount it paid to Hutchison Whampoa to buy latter’s controlling interest in its Indian Telecom business. His pronouncements in his first press conference after taking charge as FM clearly signal that securing *investor confidence* would be his foremost priority to boost *Foreign Direct Investment* (FDI), which was supposedly dented by finance ministry’s going after Vodafone: << the aim of the government’s effort would be to remove the perceived difficulties of “doing business in India”, including fears about undue regulatory burden or regulatory over-reach. “Clarity in tax laws, a stable tax regime, a non-adversarial tax administration, a fair mechanism for dispute resolution and an independent judiciary will provide great assurance to insurance (sic, investors),” “The key to restart the growth engine is to attract more investment, both from domestic and foreign investors. Since investment is an act of faith, we must remove any apprehension or distrust in the minds of investors >>. He has directed a “review” of tax provisions that have or are likely to cause disputes between tax authorities and assessees as well as of General Anti-avoidance Rules (GAAR), which aim to curb “Tax Avoidance” arrangements. Deloitte Touche Tohamastu Group (HQ in UK) – an audit, taxation, consultancy, & advisory major operating globally – says this of international perspective on “tax avoidance”, <<Tax Avoidance like Tax Evasion, seriously undermines the achievements of the public finance objectives of collecting revenues in an efficient, equitable, and effective manner>>. What is noteworthy is that Tax Avoidance is no longer held as ethical, and GAAR aims to make it no more legal. It is another matter that Deloitte has run afoul of US regulators for not reporting Standard Chartered Bank’s *illegal business dealings with Iran* (“Illegal” because US says so). PC would move true to his pronouncements to deliver Vodafone out of the tax-net. But more importantly, he would be expected to deliver on *shutting the door firmly, & hopefully permanently* that Mukherjee perhaps due to Vodafone induced myopia inadvertently opened on all such cases of *tax avoidance* or even *money laundering*. The curative remedy that Mukherjee’s team imagined to get around the Apex court judgment had to be universal in nature, and not a specific Vodafone exception to withstand judicial challenge; but it would in principle be a potent force to open up a huge can of *financial* worms. The double taxation avoidance agreement (DTAA), such as what India has signed with Mauritius, has helped Indian businesses to avoid tax and allegedly even launder money by using these DTAA for “round tripping”: <<(i) offshore investors setting up “conduits” in Mauritius solely to avail of Mauritius Treaty benefits without having any actual commercial purpose for setting up such entities; and (ii) politically more sensitive – Indian residents using Mauritius for “round tripping” funds back into India, tax avoidance and money laundering>>. Mukherjee made soothing statements then that though the remedy is universal it would be applied largely to Vodafone case and others need not worry. Corporate India wasn’t convinced that once the genie is out of the bottle it would be possible to contain it. It is this fear probably that led the Indian Media houses, companies, and their lawyers and consultants, to castigate Mukherjee trenchantly; and to now embrace PC lovingly as their deliverer. The groundwork done by the lobbies has set the stage for “the deliverer” to act without any inhibitions or fears. The argument goes thus: *Indian Economy is stalled because of falling investment. Investment is stalled because investor confidence has evaporated. Investor confidence has collapsed because of *retrospective* tax amendments (finance ministry under Mukherjee called them *clarifications*) carried out to nullify supreme court judgment in *Vodafone case* (whose entry was hailed by Indian media as largest inbound foreign direct investment to be completed, see here, here, & here). Retrospective law amendments are retrograde as they are akin to changing the goalpost after game has commenced. * How the statusco ante is restored by PC would be watched eagerly in next few weeks; but certainly a closer look at the apex court’s judgment in the light of “international thinking” on tax avoidance is in order. (a) Direct and indirect 51.96% equity ownership of HEL (b) A right to acquire (through call options) further 15.03% equity ownership of HEL subject to future change in FDI Rules. (c) Preference shares in TII and Jaykay. (d) Liabilities of USD 630 million in various subsidiaries (e) Assumption of liabilities of the Group Companies and (f) Various intangibles such as control premium, use and rights to the Hutch brand in India and a non-compete agreement with HTIL. 5. A Tax Deed dated 8th May 2007 was executed between HTIL and Vodafone, pursuant to the SPA dated 11th February 2007. Clause (4) of this deed describes Reciprocal Secondary Liabilities Indemnities and provides in its sub-clause (1) that HTIL agrees to pay to Vodafone among others, any amount on account of taxation for which a Wider Group Company becomes liable, in consequence of failure by any member of HTIL Group to discharge taxation primarily attributable to that member of HTIL Group. Soon after “completion” of the transaction, Vodafone entered into “Framework and Other Agreements” with Mr. Asim Ghosh, Mr. Analjit Singh and IDFC Group of Companies. The main effect of these agreements was that Vodafone could acquire the shares held by Mr. Asim Ghosh, Mr. Analjit Singh, and the IDFC Group of companies by paying a pre-determined price, lower than the market price. It was necessary for Vodafone to enter into these elaborate agreements/arrangements in order to safeguard its interests and exercise control of HEL and its subsidiaries, again highlighting the fact that the subject matter of the transaction was the acquisition of 66.9848% interest of HEL>>. Order of the Income Tax department when challenged by Vodafone in Mumbai High Court was held valid. High Court bench of Dr. D Y Chandrachud & J P Devdhar observed: <<the very purpose of entering into agreements between the two foreigners is to acquire the controlling interest which one foreign company held in the Indian Company, by other foreign company. This being the dominant purpose of the transaction, the transaction would certainly be subject to municipal law of India, including the Indian Income-tax Act”. The Indian Law does not permit use of any “colourable” device by any tax payer for perpetuating tax evasion in India>>. Vodafone then approached Supreme Court, which overturned the high court judgment. The 3 judge bench led by CJ Kapadia held: <<Applying the look at test in order to ascertain the true nature and character of the transaction, we hold, that the Offshore Transaction herein is a bonafide structured FDI investment into India which fell outside India’s territorial tax jurisdiction, hence not taxable. The said Offshore Transaction evidences participative investment and not a sham or tax avoidant preordained transaction. The said Offshore Transaction was between HTIL (a Cayman Islands company) and VIH (a company incorporated in Netherlands). The subject matter of the Transaction was the transfer of the CGP (a company incorporated in Cayman Islands). Consequently, the Indian Tax Authority had no territorial tax jurisdiction to tax the said Offshore Transaction. >>. The “colorable device” reference by HC was based on a 5 member bench of Apex court that had decided in 1985 the case of McDowell & Co Ltd. Vs. Commercial Tax Officer [154 ITR 148]. In this case two separate but concurring judgments were delivered; One by Justice Rangnath Mishra on behalf 4 judges that included him; and a more detailed one by Justice Chinnappa Reddy. The extent of concurrence between two separate judgments became a contentious issue to arrive at the ratio (or the scope & strength of its application subsequently) of McDowell judgment. V Venkatesan, in his Frontline article, The Tax Avoidance Debate, has given a good account of High Court & Supreme Court judgments in Vodafone case in which true import of McDowell case & Azadi Bachao Andolan case [263 ITR 706] was discussed in the context of Vodafone case by the two superior courts. There are two terms Apex court weighed upon at some length in the context of section-9 of Income Tax Act:– the “Look Through” approach, which it said was adopted by the High Court as against the “Look At” approach that it chose to adopt. The Look Through approach, as the term suggests, goes beyond the “actual transaction” and attempts to dissect *components-reality* so as to reconstruct the true purpose of transaction. It said this is not correct, and instead a Look At approach, which sees the transaction at face value, should be adopted whenever it meets a Six Points test<<· the concept of participation in investment, · the duration of time during which the Holding Structure exists, · the period of business operations in India, · the generation of taxable revenues in India, · the timing of the exit, and · the continuity of business on such exit>>. While Apex court has urged “Holistic” approach, the perusal of the judgment shows that it has examined and treated the component parts of the transaction as divisible and judged them in isolation, each on its merit, except when it administers its “Six Points test” to the whole in concluding. Whereas, high court on the other hand, while examining the component parts, has been without let conscious of the overarching vision they represent as a whole. This renders the terms “Look At” and “Look Through” fungible with little to adduce as to the defining point they purportedly make. BDO consulting Pvt. Ltd in its publication of January 2012, Vodafone Saga: The Supreme Court Verdict, has brilliantly summarized the apex court judgment. The following two tables have been taken from this publication. Issues with the Apex Court’s Judgment. The table 2 shows that original investment in the telecom business, the transfer of which is the subject matter of the case, was made in 1992 by Hutchinson Telecom Ltd.-Hong Kong (HTL,HK) directly in the Indian entity, Hutchinson Max Telecom Ltd, (HMTL-India,later HTL-India). The same position continued unchanged until 1998. The period 1998-2005 shows a massive structuring effort from HTL-HK through formation of a spate of entities/ subsidiaries in tax heavens such as Cayman Islands (HTIL-CI, CGP-CI), British Virgin Islands (HTIL-BVI-Holdings), or in DTAA heaven such as Mauritius (TII, ITL, UMTL). Even a cursory look at Table-1 shows the breathtaking complexity of multi-jurisdictional “structuring” that created “islands of opacity” that a taxman is expected to find legally impenetrable. All these holding companies have no other business purpose except to front for investments and profits. The whole effort quite obviously prepares to escape tax in India in case HTL-HK chose to divest its investment in Indian Telecom Business (HTL-India, later Hutchinson Essar Ltd or HEL-India) or for that matter to avoid tax in Hong Kong or some other jurisdiction on the profits/ royalties from Indian operations repatriated back. The Tax Deed dated 8 May 2007 between VIH & HTIL(CI) cited by the Income Tax department in its order (mentioned earlier) shows “Prior-Guilt” or “admission” of tax-obligation/ liability. Apparently, a contractual document exists between Vodafone & Hutch in which Hutch indemnifies and promises to make good the loss in case Vodafone finds itself in a situation where it’s “investment” is taxed in India. This couldn’t be verified, but the fact remains that capital gains were made by Hutch, and not Vodafone, and responsibility for paying tax thus devolves on Hutch. It is another matter that law tried to protect the government revenue stream by holding the buyer, who they can catch, responsible for tax payment, and not seller, who may be beyond its tax jurisdiction once the sale is affected. The International perspective on “Tax-Avoidance” stated in Deloitte report stipulates that tax on income or capital gains has to be paid in some jurisdiction at least. From the material on record there is nothing to indicate and no effort seems to have been made to ascertain, if capital gains made by Hutchison through divestment have been taxed at least somewhere. In absence of this information and deliberate opacity created through “structured investment”, a presumptive conclusion is inescapable that this income has escaped tax in every jurisdiction. This falls afoul of GAAR that are gaining wider appeal every day and consequently “tax heavens” are held to be of dubious value. The apex court’s contention that this is an offshore transaction (see table 1) between two or more non-resident entities (VIH-Netherlands, HTIL-CI) involving transfer of “shares” of an offshore entity (CGP-CI) doesn’t square up with its proclamation that it is a “bonafide structured FDI investment”. Because if the first contention is to be believed, then this deal is FDI neutral from India’s standpoint for no foreign investment –direct or indirect- has flowed in or flowed out. But that is not apex court’s position. It had shown concern that FDI would be affected if foreign investors were to be deterred by absence of “Transparent Tax laws” and “Stable & Predictable tax regime”. So, if this transaction is to be treated as “FDI”, which is what it wants to do, then the vendor, who has alienated his business interest in India in lieu of that “FDI”, has to submit to Indian tax jurisdiction, which the apex court says is not so. Either way it leads to logical absurdity. The timeline of the deal says that agreement between Vodafone and Hutchinson was reached by 11 February 2007 and transaction was sealed by 8 May 2007. Between these two dates the deal came under the scrutiny of Foreign Investment Promotion Board (FIPB) to see if deal violated the 74% FDI cap in telecom sector and of Reserve Bank of India (RBI) to examine whether loan agreements between HTIL and 2 “interested parties” (Asim Ghosh & Analjit Singh) violated any Foreign Exchange Management Act (FEMA) provisions or External Commercial Borrowings (ECB) guidelines. The FIPB comes under Finance Ministry, which at that time was headed significantly by P Chidambaram. The Rediff Business report dated 30 March 2007 said that government approval of Vodafone takeover of Hutch-Essar depended upon the findings of FIPB & RBI. Now, if the deal was mere transfer of “shares” of offshore companies between to offshore entities, then where was the need to seek “blessings” of government of India for the deal? That the deal went through shows “blessings” were given. 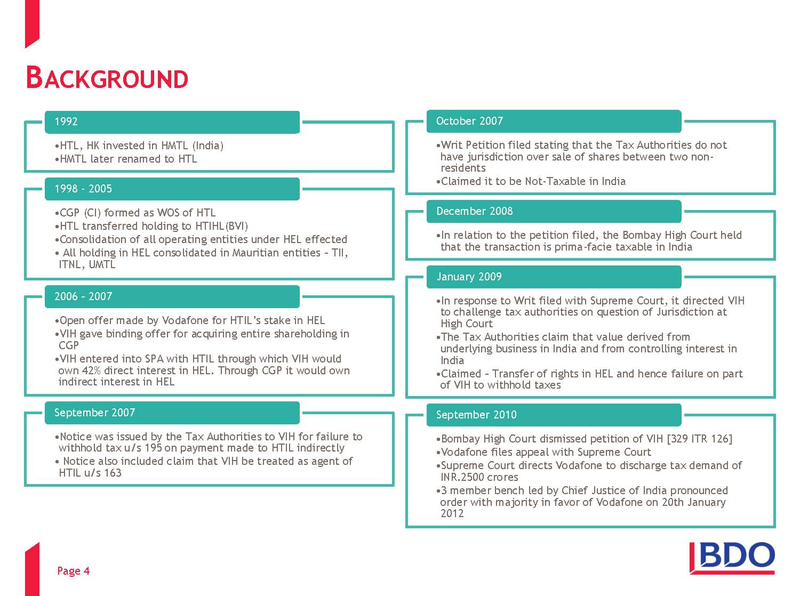 It was in September 2007 that Income Tax department, which also then came under PC, issued the notice to VIH for failure to withhold tax u/s 195 on payment made to HTIL. To understand what was at stake here, one needs to peruse the table below. All the reports and sources say that Vodafone bought 67% (=64.22+2.77, see table 3) stake in HEL-India from Hutch. The very fact that FIPB & RBI “scrutiny” yielded nothing shows that two persons of Indian Origin & operating in Indian tax jurisdiction together held 15.03% (=12.26% Kotak Stake bought in 2006+2.77% held earlier). That means Vodafone bought, or rather entered into “framework & other agreements” with two gentlemen to buy at “predetermined price” below the market price, the latter’s 15.03% stake. Therefore, from the total consideration reportedly paid by Vodafone of US$ 11.07 Billion for 67% stake in HEL, roughly USD 2.48 billion (for 22.44% of the total stake bought) was paid or set aside for paying to Ghosh & Singh. That means, at the least, over 22% of Vodafone investment, which flowed to Indian entities, was subject to withholding tax under section 195 of income tax act. Since both these gentlemen reportedly availed of Rupee Loans guaranteed by Hutch to buy Kotak stake, the foregoing conclusion is inescapable. The Apex court got around this difficulty by saying that though the total consideration of US$ 11.07 Billion included the right or option to take over 15.03% stake from the two gentlemen, Vodafone could not be said to have control over 15.03% shares (and consequently voting rights), though it paid for it. The “option to Buy”, even if paid for in advance, could at best be treated only as “potential shares”. Therefore, effective shareholding of Vodafone for “the management control” of HEL was only 51.96%; whereas exercise of 15.03% of management control was at the “sweet will” of two gentlemen, who would or could disregard the “framework & other agreements with Vodafone”. Indeed, a line of reasoning which flirts with highly improbable, if not downright implausible, route; when commonsensical & more direct approaches are available. Foot Note: There is a curious report by Express News Service (ENS) date lined 08 August 2012,FII Inflows Second Highest in several Year, which is an amusing proof, if one were needed, that P Chidambaram is darling of the corporate world & Media. It says <<Renewed faith in India’s growth story has resulted in a sharp rise in foreign inflows, with the year-to-date investment by foreign institutional investors (FIIs) touching one of the highest levels ever compared with the corresponding period in the last few years…. FIIs have infused $11.17 billion into the Indian market so far this year (CY’12, till end July). This is only a tad lower than 2010 when the same period saw FIIs investing $11.20 billion.>>. Now, Who was the finance minister of India from end 2008 to July 2012 when 2 of the highest FII inflows occurred? Chidambaram?? At least that is what ENS seems to think oblivious of the fact that PC was appointed FM only in August and has not even completed a week in that post: <<Market experts attribute the inflows to the renewed optimism in Indian equities, which is expected to benefit from favourable fiscal and monetary actions by the government. Finance minister P Chidambaram has allayed investors’ fears on policy paralysis and assured to put the country back on a high growth trajectory by reducing trade and fiscal deficit>>.PC seems to have the power to affect business sentiments & economy retrospectively.